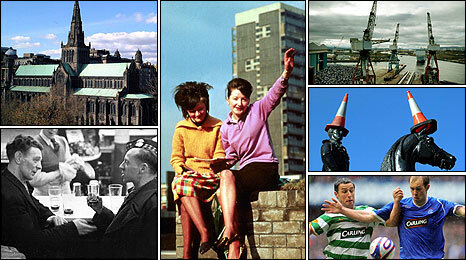 BBC NEWS | UK | Magazine | Does 'Glaswegian' need translation? An English translation company is looking for people to help interpret the Glaswegian dialect for its often bemused clients. But how hard is it for non-natives of the city to understand a "Weegie"? If you don't know your midden from your cludgie, you might in future turn to Today Translations for an explanation. The London-based translation company is advertising for people with a knowledge of the Glaswegian dialect, accent and "nuances" to help interpret for some of its baffled clients when they visit the Scottish city. It has received more than 300 applications for the job so far, some of which had been written in "Glaswegian". Glaswegians, known affectionately as Weegies, speak varying levels of a continually-evolving form of dialect widely known as 'the patter'. The speech comprises a range of Scots expressions, vocabulary and humour, as well examples of rhyming slang, local cultural references, nicknames and street language. "Glaswegian" has given rise to a plethora of phrasebooks, joke books, online glossaries and merchandise, not to mention TV and radio shows. There is even a Glasgow Bible, which relates some biblical tales in the vernacular. In the 1970s, Glasgow-born comedian Stanley Baxter parodied the patter on his television sketch show "Parliamo Glasgow". But does Glaswegian really need translation? Understanding will be in the ear of the beholder. Here's you chance to find out. Click on the audio to hear Colum Buchanan, 50, read his application for the job of Glaswegian interpreter. Noticed your small ad this morning in ra Herald [newspaper]. Hauvnae [I haven't got] a VC let alone a CV in relation to this type of public service. Anyhows I'm 50 years old, born up a close [in a tenement building] in the West End, raised in leafy coonsil hoose [council house] aristocracy on the Sooothside [south side of the city], went to the Mossy and the Minors in Hillhead [cinemas], educated in East Endisisms at Ramungo [St Mungo's Academy, Glasgow]. To actually believe that business people talk in "Weegie" language is hard to believe. I have worked in business for over 30 years and I am fluent in three languages and one of them is not Glaswegian. I would never dream of using Glaswegian during my daily work hours. In fact, it makes me wonder what business section has a dire need of Glaswegian fluent speakers. Geezabreak ok. 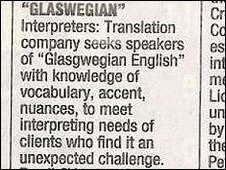 I'm horrified that the newspaper advert has asked for translaters of Glasweigain ENGLISH, which exists as much as the loch ness monster. Scotland has rich LANGUAGE, otherwise why the need for a translation in the first place? Away an beil yer heid son! Any dialect that uses the word 'How' to mean 'Why' needs all the translators it can get. Although not from Glasgow I understood both poems without the translation. In Ayrshire we use similar dialect which I tend to use a lot depending on who I'm talking to. I feel most relaxed when I use local dialect but I generally hold back and "speak properly" to certain people because I'm worried I may seem less intelligent. I've lived in Glasgow all my life (18 years)and come from a working class background. Most people in Glasgow don't talk like that- only neds and Sun readers! However I do have English cousins and when we were young they used to pretend not to be able to understand us. I think Londoners need their ears cleaned if they don't understand us Glaswegians. Of course Londoners have the reputation of being some of the rudest people on the planet so it's more likely they just pretend no to understand like my cousins did when they were kids. Why is this a story? It's remarkable that after hundreds of years we're still talking about how amusing British dialectal differences are. In reality it's a thinly veiled mocking of the North by the South. 'Weegies' is actually a disparaging term that Edinburgians use to describe folk from Glasgow. If an American from the Midwest can understand without too much difficulty, what's a Brit's excuse? Ah dinnia ken whit awe the fuss is aboot Ah left Glesga 60 year ago at 22 and Icun still unnersdtuan every word that was said.